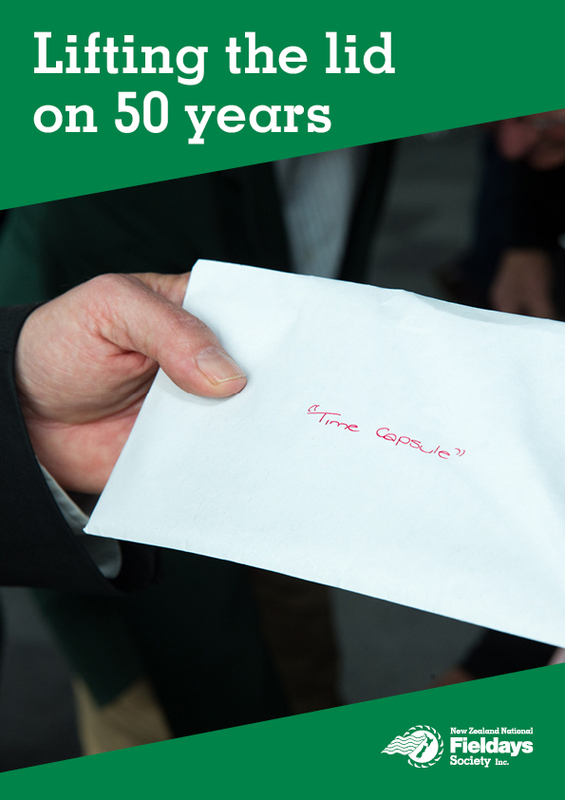 In early 1995, letters were delivered from organisations and individuals around the country addressed to the New Zealand National Fieldays Society’s time capsule. The stainless-steel capsule was placed in the entrance to the Mystery Creek Pavilion upon the building’s completion in May 1995 with the instructions to be opened in the 50th year of Fieldays. Flash forward 23 years to 2018 when the time arrived to see what was inside and what the predictions were for how the agricultural industry has changed. Surrounded by a selection of Society board members, staff, past presidents and life members; the capsule was lifted revealing many perfectly in-tact letters and various pieces of history. There were forecasts of artificial breeding, genetic engineering, a cashless society, an increase in corporate farming and lifestyle blocks and possums becoming extinct. Visitors were chartered to the event on flights from around the country, electronic banking was a hot topic of the time and predictions of new technologies were countless. A selection of these letters have been compiled to form a slice of the Society’s history – enjoy! Click here to download the capsule letters.